Just imagining what a younger version of ourselves would have deemed appropriate for a lifetime inking is terrifying. But what if that 18-year-old could choose to temporarily memorialize their enthusiastic love of ska for only the year they skanked to The Specials and Reel Big Fish? All the cred, none of the commitment. Ephemeral is trying to make tattoos for the commitment-shy a reality. A group of current and former NYU engineering students are developing a nonpermanent ink that can be applied with the same technique and equipment employed by traditional tattoo artists. But instead of living with a terrible mistake, the ink can be erased completely (or modified) after a year with a removal solution that is traced over the tattoo — again, by any tattoo artist using their own gear. Traditional tattoos use needles to get ink into the dermis of the skin. This causes the body to go into cleanup mode: Immune system cells go to the site of the punctures, and while some of the ink is flushed away, most of the ink molecules are too large to be carried away, and thus are "swallowed" by the immune system cells or dermis cells that remain in place. And thus, permanent tattoos remain. However, the Ephemeral ink uses smaller molecules, which are eventually flushed out when the removal solution is applied. It's a pretty neat solution for those who appreciate body art and experimentation — or anyone who is dying to declare their love for something they secretly suspect might not be worthy of permanency. The product is still in development. The Ephemeral folks told TechCrunch that they hope to have something ready by fall of next year and that pricing isn't settled but could be in the range of $50-$100 for an "average sized tattoo." While you're waiting, there are always henna tattoos and a range of other shorter-lived temporary tattoos. 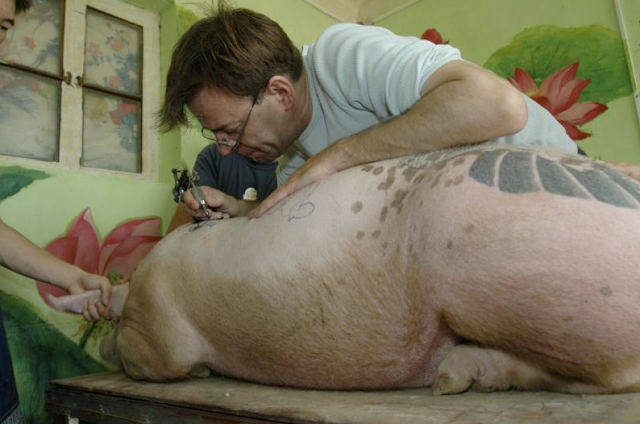 Ephemeral ink won't be available for a year or so, and is still being tested on pigs (similar enough to humans for a good research model). So don't judge if you see a hog walking around with a cringe-worthy tattoo: It may just be a passing fancy.